If you are serious about your garden, this is the barn for you. 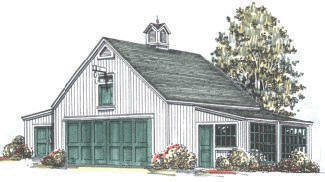 It will park two cars, trucks or tractors and swallow up your seed and supplies in its high, dry storage loft. It has a greenhouse with doors that are big enough for a lawn mower and a separate shed for your yard tractor, tools and workshop. Floor area is 972 Sq.Ft. Loft Area is 576 Sq.Ft.